Fall has arrived. At least, I hope this is really it. Autumn usually gets here by stops and starts, tricking all of us into excitedly digging out jackets and blankets by sending a few cool mornings, and then – bam! – laughing at us while we grumble and fan ourselves through a suddenly-hot-again week. It goes back and forth, back and forth, until the the joke gets old; then Autumn gets serious and finally lets us have our precious few weeks of perfect weather before exiting the stage to make way for Winter’s bone-chilling turn. With the change in weather come all the signs of fall. Nai-nais bundled against the frigid 70-degree mornings. Rambutan and green tangerines making their annual debut at the market. The nights getting quieter as the chorus of crickets slowly dies down. But the surest sign of fall here in our little town is one that makes me feel happy and homesick all at once. 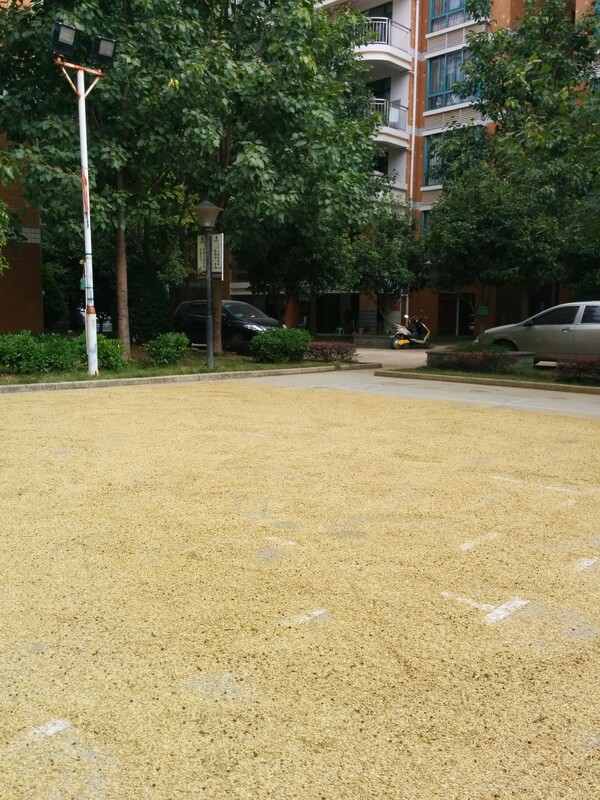 For the past few days, the open concrete areas around town – the basketball court in our apartment complex, the sidewalks nearby, the plaza in front of the movie theater – have been covered in rice. This is newly harvested, unhulled rice, brought from the fields in giant bags and dumped out to dry. In the morning, aunties and grannies carefully use long wooden paddles to spread the mounds into a single layer. They’re hoping for a good sunny day to dry the grains, and for breezes later when they winnow the rice in their big, round, flat baskets. As the sun sets, they scoop the grains back into the enormous bags, lest this year’s supply of the family’s main staple get stolen by rats in the night. There is something about seeing this that has me thinking really far back. I’m pondering harvest, and how it goes farther back than special coffee drinks and scarecrow decorations, farther back than my Midwestern roots, farther back than my own existence. T here is a good chance this is because I’ve been reading too many of my kids’ homeschooling books. (Readers gonna read.) There’s been a lot this semester about the importance of harvest in places like the early American colonies and ancient Egypt. Humans have been doing this for millenia. The weather turns, and it’s time for harvest. This is our shared history. And so, I look at those piles of rice. This is food my ancestors never ate, drying in the sun thousands of miles from my home, yet somehow, I feel connected. That makes me happy. But looking at the rice also makes me think about the families that have worked so hard together in the fields during the past few days. Harvest is when families come home, neighbors gather, everyone pulls together to get the crops in. And that makes me homesick. So, I walk past those grannies and aunties and piles of rice, and I smile, but it’s a slightly sad smile. And with all those thoughts in my head about harvest and history and home, I walk along, pondering my way into a cool Autumn evening.